This workflow incorporates some of the Ha data into the SII and OIII images to simulate natural star color and boost the signal of the weaker SII and OIII channels, and also somewhat simulates the hydrogen-beta (Hb) spectrum in star color. This method works particularly well when one of the channels (usually SII) is extremely weak. 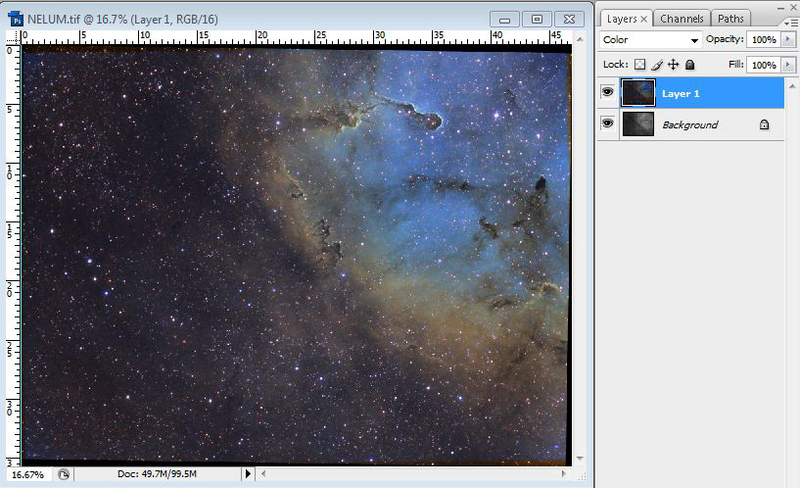 For this workflow I will be using one panel of a mosaic image of IC1396 and Photoshop CS3. 2. Lightly stretch the Ha image using curves/levels. A guide here would be to aim for ½ or less of the full stretching you intend to do. Do the exact same stretching for the SII and OIII frames. (You may want to record a Photoshop “action” while you stretch the Ha, in order to exactly replicate the stretching for all channels). The idea here is to bring out some stars but not over-saturate. 3. Save the lightly stretched images. 4. Duplicate the images again, and use the duplicates to create a “master luminosity” as described by JP Metsavainio in his “Tonemap” method. (Step II in the Tonemap powerpoint presentation). 5. 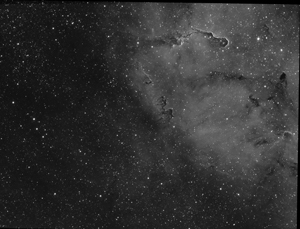 Processing images for star color and nebula color Open the lightly stretched SII/Ha/OIII images (the ones used to create the master LUM). Duplicate SII and OIII images, close original SII and OIII images. “Apply” 20% of the Ha image to the SII and OIII images (Image/Apply Image – in the dialogue set the blend mode to “normal” and opacity to 20%). 6. Assemble hubble palette image (SII=R, Ha=G, OIII=B). Copy the Ha image on top of the SII image, and copy the OIII image on top of the Ha layer. You can close the Ha and OIII images. Save the new file as something like “[object name]-stars-color.tif”. 8. Match RGB black point with levels. 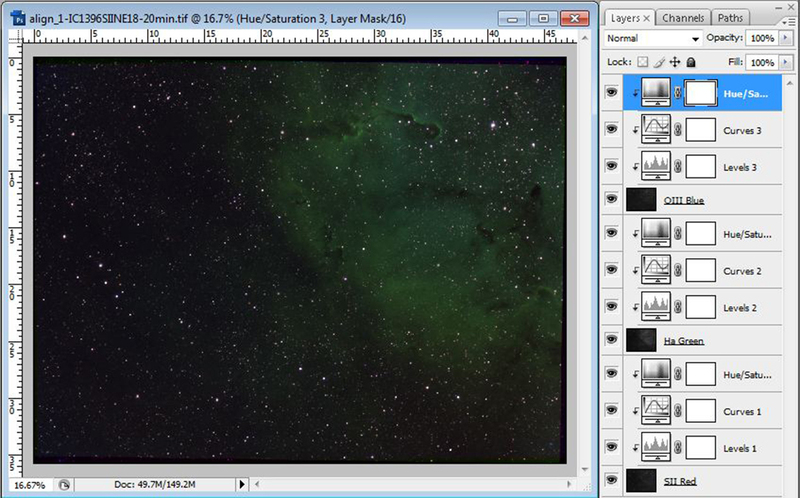 Stretch the SII and OIII layers using curves/levels to match the histogram of the Ha (green). 9. LIGHTLY process the image to taste (Noise reduction? Gradient? Sharpen? Stretch image to taste, but the idea here is just to go after color in the stars and nebula). If not done before, flatten the image. 10. The stars are probably much too magenta. Duplicate the layer, use “selective color” adjustments and under magenta, reduce the magenta to 0 and increase the cyan to 100. 13. Increase the saturation by 20%, select stars in the base layer (expand/feather), go back to the saturation layer and go to layer/layer mask/reveal selection. Now the stars in the image should be a more natural color without magenta, without increasing the saturation of background noise or in the nebula. 15. Adjust nebula color to taste by using “selective color” adjustments. You may also need to increase the saturation of the entire image. 16. Place the image with colored stars on top of the Tonemap Master LUM, set the blend mode to “color". 17. The color saturation will probably need to be increased by either hue/saturation and/or curves. 18. Process the final image to your personal taste.